I think I already knew this, but I definitely know now that I have a little secret. You know all that hard, "thankless" stuff that comes with being the mom? I love it. I always sort of loved it that I was the only one who could make that one baby stop crying. I had all sorts of techniques worked out for surviving the long, lonely hours in the baby's room in the night. I took pride in loving my child so much that I would comfort them no matter what- even if it meant letting them throw up in my lap. At the time, I didn't love all that stuff so much, but I did know that all that stuff meant that I loved them. It was so tangible. That kind of service and sacrifice was a way of seeing how I loved them. I was willing to give up my own comfort for their sakes. Suddenly (well, not exactly suddenly...), I wasn't able to do that stuff anymore. I couldn't handle being up 3 times in the night. I couldn't afford to let them cry their snot all over me because I'd be sick for weeks. I couldn't get up the next day and take them to the park or the zoo after a rough night. I couldn't keep breastfeeding. All those exclusive, mommy-only rights started to fall away. I needed more care than they did sometimes! Sometimes, I still feel like the weakest little link. We don't worry so much anymore about overtaxing the kids or skipping their rest time, but we definitely worry about those things for me. I'm basically the baby now, the one whose physical needs can dictate the course of an entire day. I HATE that part of being sick the very most. It is everything I never wanted. Instead of feeling like the reliable, go-to comforter, I feel like the one everyone else needs to worry about. There are a lot of deep reasons why this bothers me so much. I'm sure I don't understand all the reasons, but I do see that this concept, being the weakest link, worms it's way into most of my fears. I'm sure a lot of it has to do with growing up in the ballet world where there is always someone waiting to take over the minute you can't hack it. There are other old reasons too. Whatever the reasons the challenge exists, the challenge itself is now to not succumb to the wrong belief that I'm useless because I'm physically fragile. "Wow, she just got really deep really quick, and I thought I'd just be reading some funny puke stories..."
Learn that my much awaited hematology visit of the previous week revealed exactly what I didn't want: red blood cells die off too quickly giving me low hematocrit which make you feel crappy but really can't be fixed. Me: POTS symptoms going crazy from stress and allergies. Terror over "violent talking" son's surgery scheduled for next morning. Lying on floor with rib out due to growing pregnant belly crying into my ears and carpet. Quitting "job" via text message to my "boss." Surgery for son goes well after sleepless night for mother. Mother, me, gets some time to rest. Things are looking up. Surgery son back at school already. I go on MUCH NEEDED friend date to U.Village with some besties. Get text message (20 minutes after it was sent) that Hazel is vomiting. Hazel throws up every 10 or 20 minutes for 6 hours straight before switching over to uncontrollable diarrhea... in her sleep. Boys at school. I help Hazel recover and wait to begin vomiting... which never happens. Worried about the girl, I take her to urgent care at Children's to rule out things that would need medication. Ezra begins having abdominal pain. I do my best to be in denial about it all so that I can go to the school auction night with my husband because that's about the best we can do for dates these days, and I've been looking forward to it for months. Seriously. Ez and Ivo develop fevers. Ivo starts complaining of nausea and crying because he is so scared that he is going to throw-up. I continue pretending I'm going to the bleepin' auction and do my hair. Hazel helps pick out my dress. Ivo vomits on me and the nicest chair in my house, that rocker from Land of Nod. I text babysitter that it's a no-go. Repeat (to myself) a NO-GO. Ezra's pain becomes so bad that he is crying with each cramp. I get on the phone with doctor who says if a tums doesn't do anything to take him to the ER. Tums makes him vomit. Please note: there are now two vomiters. I start getting the people settled for bed. Brendan says he doesn't feel well. I think, "FML." I have people put to bed, and I come upstairs. Brendan takes one look at me and immediately runs to toilet to vomit like a fire hydrant. Correlation does not equal causation. Ivo vomits all over his bed and cries for a while because he "is so stressed out. Just so stressed out." Hazel vomits and screams about how she doesn't want to vomit. I develop a soon-to-be-patented method of dealing with this involving a multi-layered towel nest. I commit to aborting plan to downsize our towel volume. Hazel finally settles down. Ezra wakes up and comes to wake me up to make sure I know that his tummy still hurts, but he thinks he's done vomiting. Good to know. Two boys come up to tell me that they are awake and feel fine. Again, good to know. Kids then played for two hours together downstairs without incident. REPEAT: TWO HOURS WITHOUT INCIDENT (and I don't mean vomit, I mean cruelty and infighting. This is nothing short of a miracle.) I help Hazel with her "poop squirting all over." I also send a desperate text to my mother-in-law to come with supplies. I tuck Hazel and Brendan in to rest in our bed. Even though they don't smell the best, I note that they are the cutest thing ever. Hazel makes nursing face in her sleep. I go out to see the boys and begin their pedialyte/apple sauce regimen. Ezra suggests hot beads as an activity, and they play while I BLEACH THE WORLD. Mother-in-law comes with color-coded vomit buckets for the kids and more Saltines and applesauce than any mommy ever hoped for. She also brings me breakfast, Lysol, and Clorox Wipes. She is great. I do laundry, change sheets, rock kids, force fluids, wipe bottoms, sneak food into my mouth after bleaching my hands, take a little nap while Brendan and kids watch some Netflix. We have a pretty fantastic, chill day ending with bowls of white rice. My POTS symptoms become extreme. We all go to bed. We all sleep all night. Brendan stays home. I sleep a lot. Everyone starts to feel better. I become obsessed with watching Escape to River Cottage. I realize how much I loved taking care of everyone. I still can physically care for the people. God gives me what I need when I need it. They saw me as comforter, and none of them acted surprised. They still see me as Mommy and bearing all the qualities I want to have included in that glorious title. I appreciate the ability to physically serve in a way I never did before. Now that those "thankless" jobs aren't always a given for me, I'm so happy when I'm able to do them! This is a huge encouragement to me because I have been concerned about how I'm going to deal with a newborn. But, there is a part of me that is looking forward to the opportunity to lean on God in new, dramatic ways for that privilege of rocking a baby in the night. I know it will be hard. I KNOW. I know with the knowledge of a lady who had 3 babies in 3.5 years and then got sick with a "probably forever" kind of sickness. But for every degree of difficulty I can fathom, I have knowledge too of what God can do and does do through people who pray and trust in him. Thanks to everyone who prayed for us and in any way covered and provided for us over the last couple of weeks! I'm praying for you all to be blessed for your kindness! Perhaps you have noticed the "Artist's Challenge" going around. It's as contagious as the flu. As an artist who met a challenge that was too great to overcome, the whole thing has pretty much made me feel like I have the flu. The symptoms of artistic nostalgia, intense fits of longing, and a heart full of stifled movement cannot be managed by medication. However, gratefulness is an antidote to the bitterness that threatens to develop. I wouldn't have posted this except that I was actually nominated, and I'm grateful. I wish that I had piles of beautiful ballet photos to share, but I don't. I do have a few from my student days, and I'm so happy that I was allowed a taste of living that dream. My dancing days are going on being half my lifetime away from me. It's a weird sensation because I still identify as a dancer on the inside (and still use ballet as my excuse for my ugly feet when the pedicurist rolls her eyes!). My own little "artist's challenge" for years now has been figuring out how to live artistically and express myself without access to the medium In which I was trained. I have managed to find some ways to do this- mostly through dance partying with my children. But, I also like to cook, garden, work as a doula, write, make jewelry, create terrariums, and (lately) felt. Here's the thing, though: I'm pretty consumed these days with my main job, being a mother. All those other things fill in the gaps, the very few and narrow gaps. 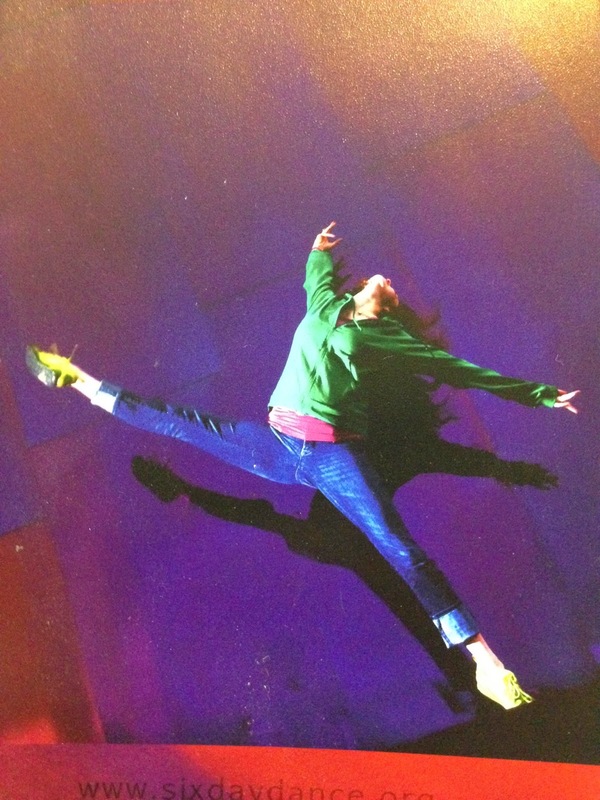 I think that what is important is to apply the love and skill I had for dancing to all the other areas of my life. 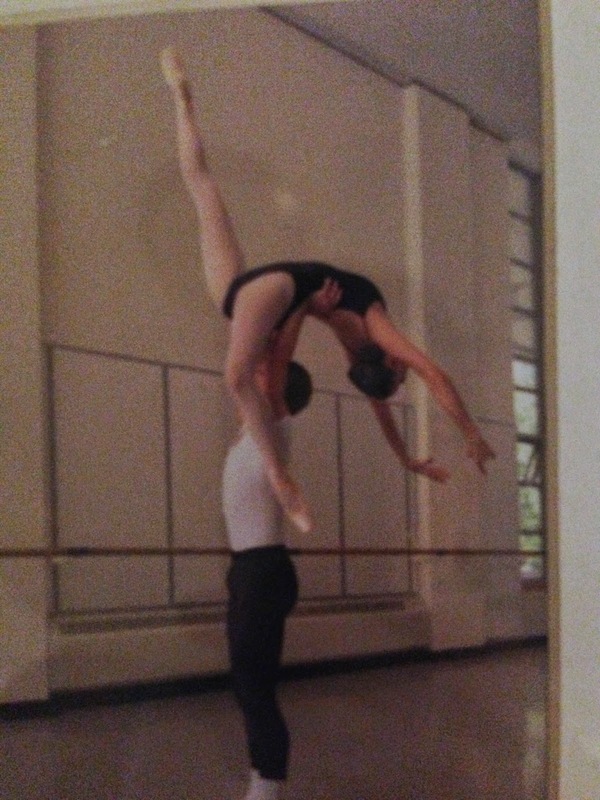 Training to be a professional ballet dancer requires great commitment, sacrifice, risk, and LOVE. You have to love it so much that you are willing to keep going. You have to believe that it is worth pursuing- not just for you, but for the world. So, I try to believe that creative pursuits are worth the trouble. It is easier to live mundanely- MUCH easier. It's less messy, less risky, but less fun. 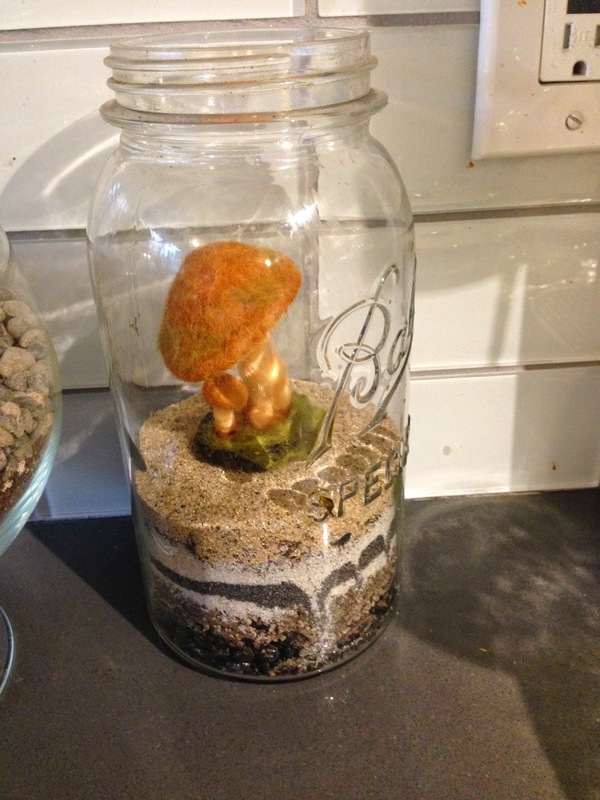 Choosing to do crazy things like covering my kitchen counter in dirt, plants, rocks, and moss for an afternoon of putting terrariums together even though I KNOW my kids are going to get dirt all over my house is my way of being an artist now. Are the results always terrific? No. Does my world feel richer? Yes. My willingness to live in this manner has been challenged by the development of chronic illness in my body. So far, my life displays a pattern: fall in love with something; become damaged in some new way; try to move on without bitterness. My life is not uniques in this. I think that's just being here and growing up, and we all have to do that. I think the real nugget of goodness in this whole "artist's challenge" business is that it reveals what artsy people know already: it's ok to be proud of what you make. It will feel weird most of the time, and it comes with lots of insecurity. But, artists love what they do so much that they just can't help but do it anyway and hopefully share it with the rest of us. So, I'm writing a blog post that makes me feel insecure. But I love writing, so I'm doing it anyway. And I'm willing to believe that posting it will be worth the risk of exposing myself. 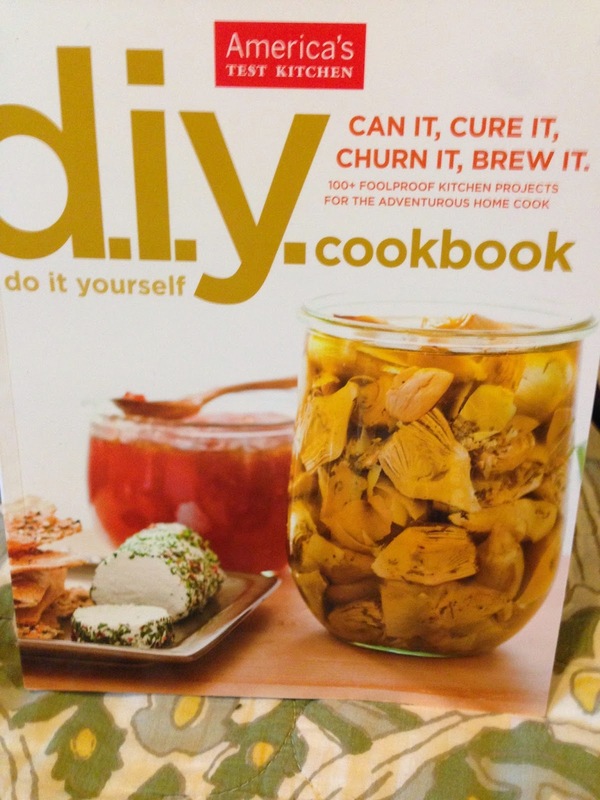 And I bought the America's Test Kitchen D.I.Y. Cookbook because even though I can buy pickles, I love them so much that I want to figure it out myself. The pursuit is worth the time to me. My kids will know where pickles come from! And I submitted a terrarium full of hand-felted plants to the school auction because even though it may actually be extremely dorky, I loved making it and want to share it. I don't dance for very many people any more, but I certainly don't love dancing any less. For me, the risk of pursuing an artistic life did not pay off in the way that I hoped. At least, though, I learned that the pursuit itself is worth it to me. Enjoying creativity at the cost of practicality is a challenge I hope to meet everyday- even if I'm doing it from my bed. 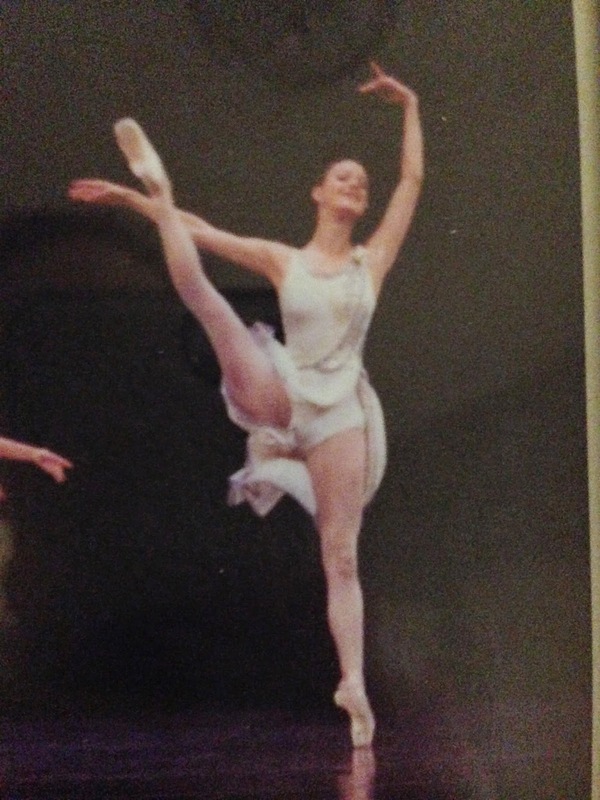 My children love to talk about and even re-enact (oh, the joy) my ballet accident because even though it makes them sad, they see that moment as the start to their own stories. 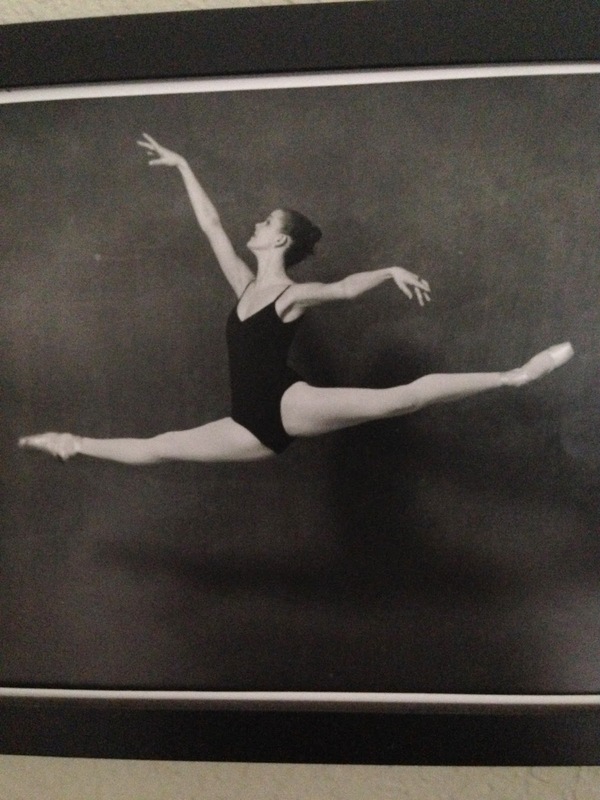 "Mommy loved ballet so much, but then she got hurt and couldn't do it anymore. So, she had us and now she has a job she loves even better than ballet!" What a great story! The thought of my kids growing up to love something like ballet actually terrifies me because I know how painful it may be if it doesn't work out how they want. But, if I can communicate to them through pursuing my own interests over and over, engaging them in the messy, rewarding processes, that art is for knowing more love and beauty and sharing with others- and not necessarily about "success," then I know they will be blessed by it for a lifetime as I am. I nominate anyone I know to accept the challenge of doing something you love even if it may be a bit inconvenient. I challenge you to share something with someone else. Clearly, photography is not one of my gifts!